Right now, one of my fur babies is sick. My brown bunny-Pepper is having a case of rabbit “head tilt“. We already took her to the vet. Pepper had a antibiotic injection and was prescribed Polecin. To be administered twice a day. Two drops on every ear. 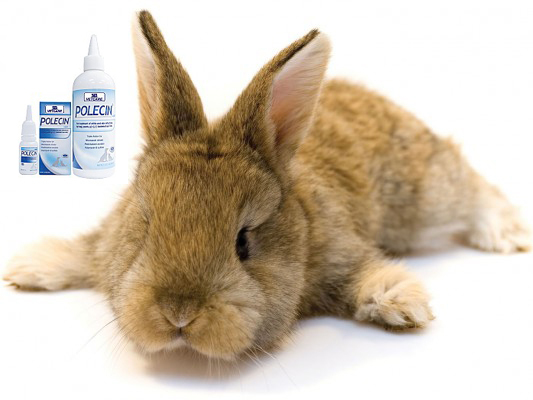 By now I am also giving Trixy-the white bunny a drop of Polecin on each ear. Preventive measures. say hello to the trifold version! While doing that, I am also busy crafting/sewing. Yes another D.I.Y. project. I must be cray. This time it is for my flower girls. Actually, I am quite happy with their dresses because they look like what I really wanted. 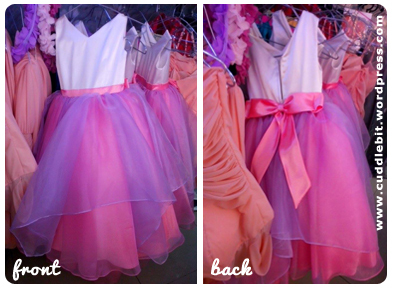 At the shop: the girls dresses before the flowers, pardon the lighting. They look cute right? I am still waiting for the embellishments. So fast forward to a few days after… the dresses now look like this. Ugh. Yes. I wanted applique flowers. But, not those reddish-purple flowers… It is not my color. I specifically asked for pastel colors. blush, lilac and peach. I got blush, purple and the reddish-purple color I hate. So, I had to get it fixed. 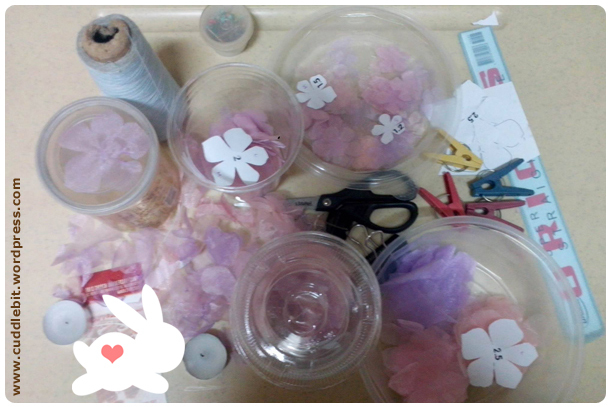 But again since December is so near… there is no way the seamstress is going to get the time to make new flowers. That leaves me with: take it as it is or create my own flowers. I chose the latter. Again I blame my O.C. -ness. 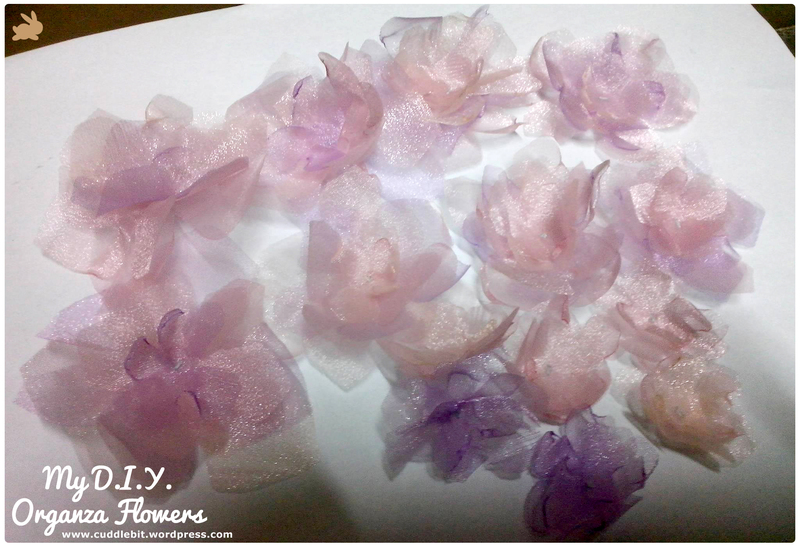 So I created flower templates and got 3 yards of crystal organza (these are the shiny type of organza) -one yard per color. And the madness starts. 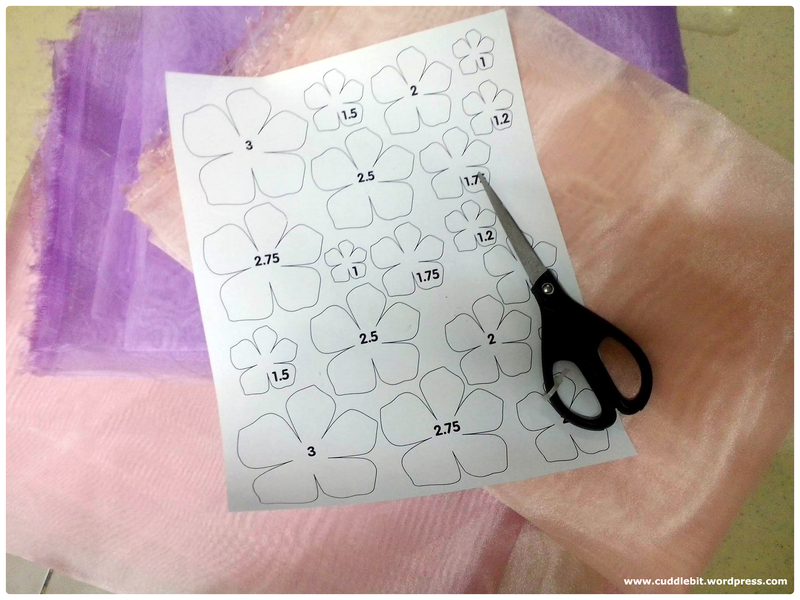 I began cutting out flowers of different sizes that turned out to hacking the fabric with scissors! All the while asking myself why did I even start this madness? After that photo I have no more decent photos as I was busy burning and sewing the fabric flowers. I will just tell you that it was not easy. I am having a hard time taking a photo of what I am doing and doing the burning so, this photo is just to give you an idea on what I am doing… do I even make sense? 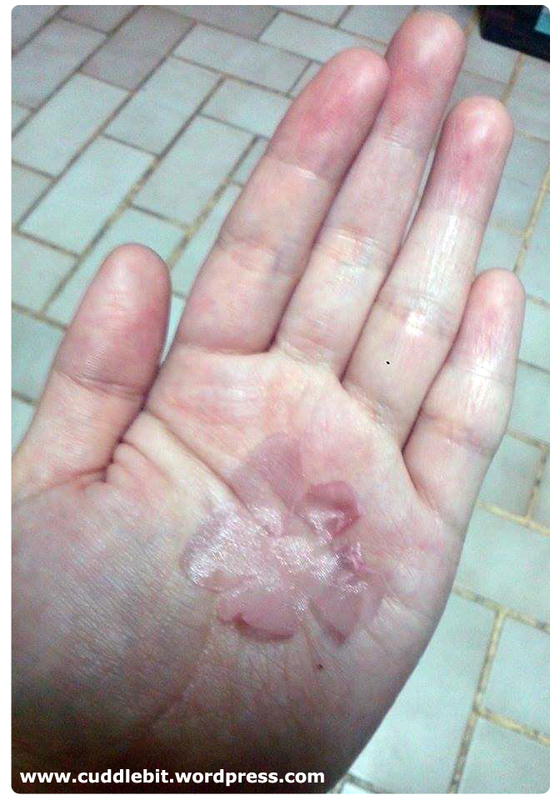 Most of my flowers came out burnt, my hands are also a bit burned. My success rate is a mere 30%. this one is a success! 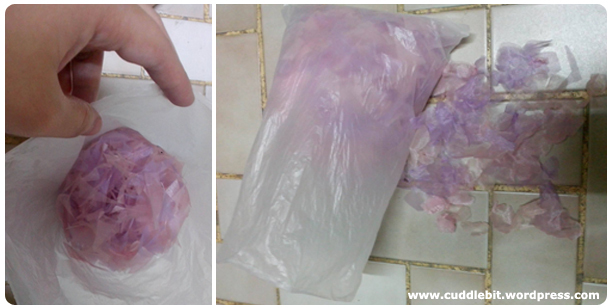 so burn around five more (six per layers per flower) and sew them up. So here is my weird and wonky burned flowers. Out of ten flowers, only three make it. And some of the wastage I managed to take a photo of… my nanny swept off most of my mess. all this scraps in one day. Of course finally the product of my burnt hands and sweat. these are made with sweat and tears. 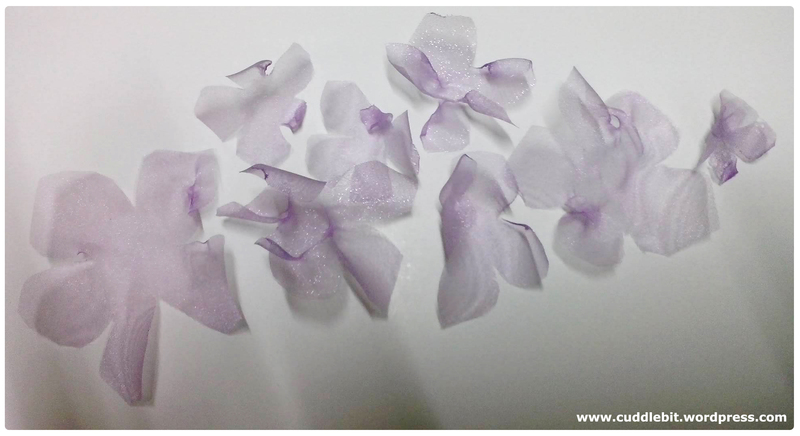 I only managed to make around six flowers in a three/four hours – I do this after dinner before going to bed. Usually start making these around eight in the evening and throwing in the towel by twelve. I need around eight flowers and six tiny flowers per flower girl. Categories: animals, fashion, Uncategorized, wedding | Tags: 2015, 2015 bride, burning, craft, diy, fabric flowers, flower girl, flowergirls, flowers, organza flowers, Philippines, rabbits, sewing, wedding, wedding preps | Permalink. 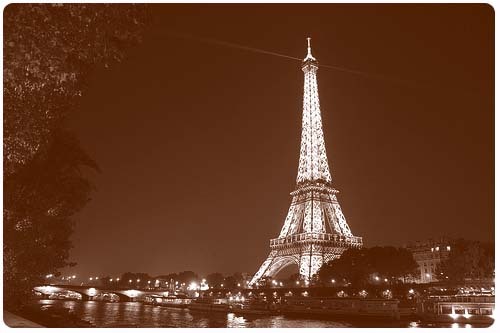 Saddened about the tragedy in Paris… all my thoughts are with the french people. *updated to include the photos of the actual getting ready dress I used on the day of the wedding. Brides mostly wear robes while getting ready because robes don’t need to be pulled over the head, so that it does not mess up the perfectly styled hair. Button up shirts is also favored for the same reason. Sure, I get why. But no bath robe for me. I don’t want to have pictures taken that I am wearing a bath robe. Why? Because as much as I love the comfy terrycloth bathrobe, they would look horrid in pictures. Like I just used the hotel supplied robes. 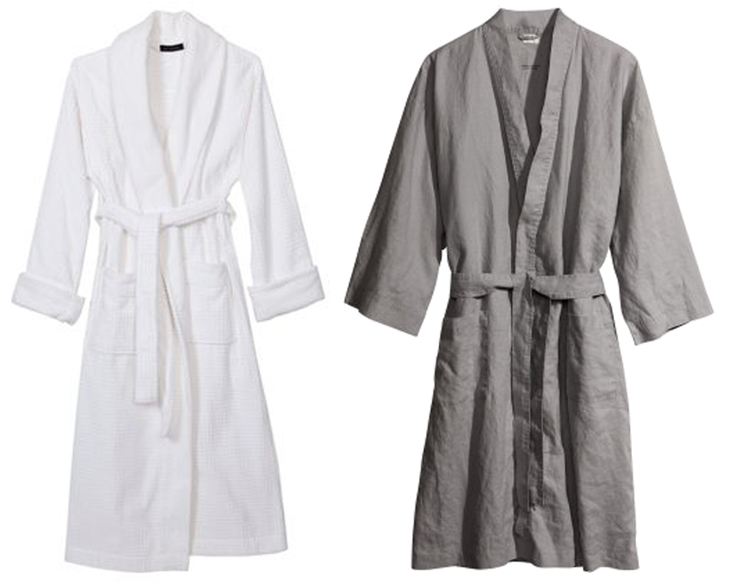 I also like those linen robes, but those usually come in drab colors, like white or grey. Cotton voile robes are hard to find, or has a dowdy print. Silk and satin robes are not really what I am looking for. Shiny fabrics are not my thing. And lately there are those custom made (robes) shiny lace-y ones that are all the rage right now, are absolutely a no for my wallet! Sure I like that they can be customized, they look really pretty and all but, I don’t think I would wear it again after the wedding. With the money I need to shell out for a custom made robe, I’d rather get a dress I love that I can wear again and again. If I only have a ton of money, this Alexis Mabille dress Lea Seydoux wore will be my getting ready dress. I wish. I love it and I wouldn’t change a thing! Photo from RCFA. But, I don’t (have a ton of money). And even if I love the hemline, it will not be practical. So, I will just have to get the inspiration. I have always liked trench coat inspired dress so this is the chance to get myself one! I searched specifically for white ones to look more bride appropriate. 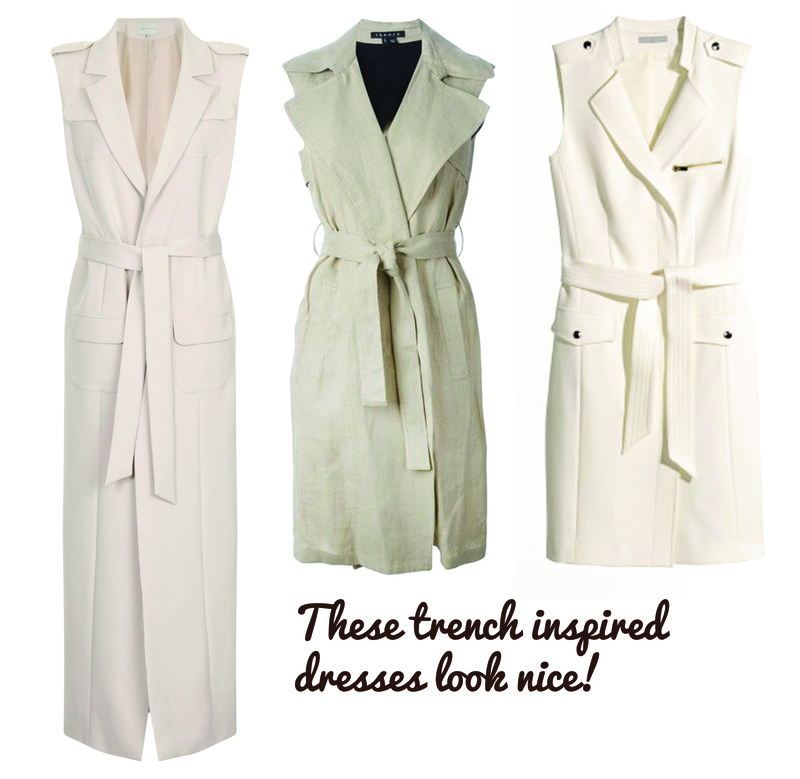 trench coat inspired dresses! photos from the internet. These fit the bill as it is a dress that wouldn’t mess my hair. I just wanted to make it look a bit more trench coat looking, with the double breasted buttons. I also wanted it to be knee length with pockets on the sides. 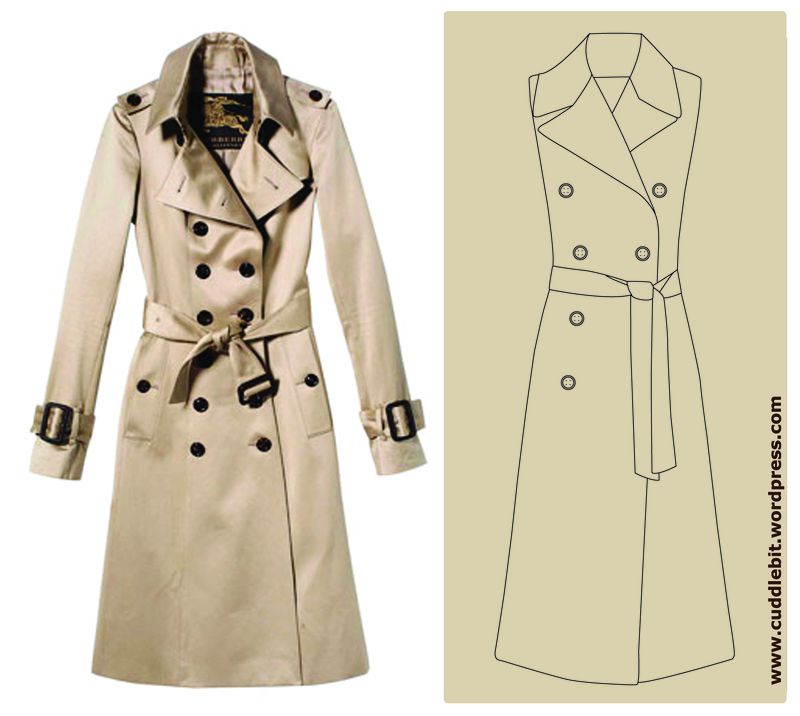 My inspiration is a classic trench coat. Its timeless. They are simple, stylish and always look classy. So after a bit of doodling… this will be my getting ready dress! A sleeveless, trench inspired number. That is perfect for our warm weather. I could use and re-use and reuse this. I based the design from the classic trench. Pure linen fabric would be a good choice as it is breathable and not shiny! Initially, I wanted my dress to be white or blush pink but there is no blush pink linen fabric to be found. The options only include white (I did not get white in the end as it would be difficult to maintain), grey, dark grey, blue, navy blue, brown, khaki, rust (my Mum likes this one), fuchsia and teal (my pick). After much deliberation, I went with teal as it is a bright happy color. Plus it really works with my skin tone. The rust made my skin look a bit darker. And off to the seamstress I go! Woot! *so here is the updated part. I personalized my getting ready dress. It had personalized embroidery on the sash! It would be there but not really too obvious. Since I am taking Kei’s last name when I get married I got the embroidery to be ‘Mrs. Husband’sFirstAndLastName’. On second thought I wanted it to be ‘THE Mrs. Husband’sFirstAndLastName’! For added impact! hahaha! Here I am wearing the actual getting ready trench inspired dress on the day of the wedding. Sorry had to delete parts of the name. My trench dress in action! -My cousin wore a simple gown on the morning of her wedding, another cousin wore a silk robe, a friend I know wore a button down polo. I have also seen other brides (to-be) don a simple dress. 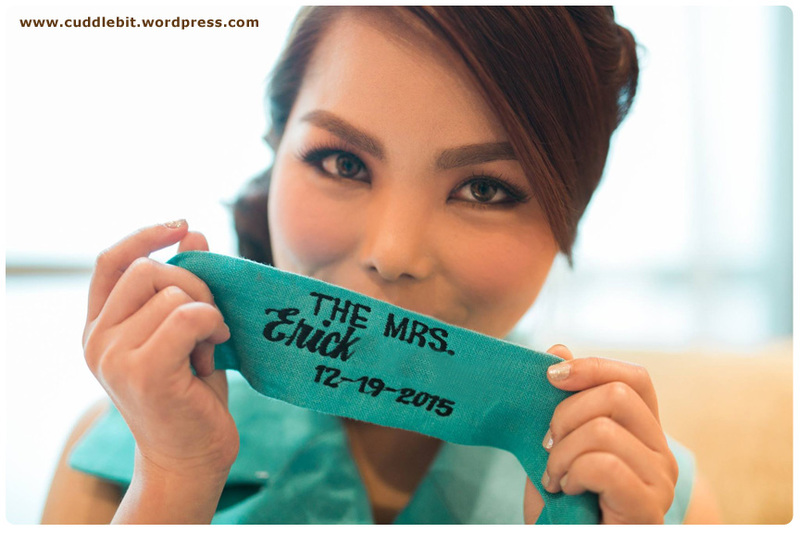 I am just curious… what did you wear/planning to wear as your “getting ready outfit” on the morning of your wedding? Categories: dresses, fashion, wedding | Tags: 2015 bride, 2015 wedding, Alexis Mabille, bathrobe, custom made, custom made robe, dress, fabric, Fabric shopping, getting ready, getting ready dress, Lea Seydoux, linen, morning of the wedding, pure linen, robe, silk, sleeveless, teal, trenchcoat, wedding preps | Permalink. After visiting the designer of our entourage -to accompany Kei’s sister and mom to fit their dresses. We proudly decided to show them our tiny, messy place. Hahaha! They found the place “maaliwalas” bright and airy. They also saw the lack of furniture. Sigh. And we went on to recount the heartache. And so, we arrived! I also have to tell you that I am very sorry for the lack of pictures. I left my camera at home and all I have was my phone that was on a bleeping low batt at the time. So, all the pictures here are from the internet. Walking in we tried the mattresses in their testing area. lie down on all the beds?! Sure. We picked out the orthopedic bed as it was the non negotiable for me. 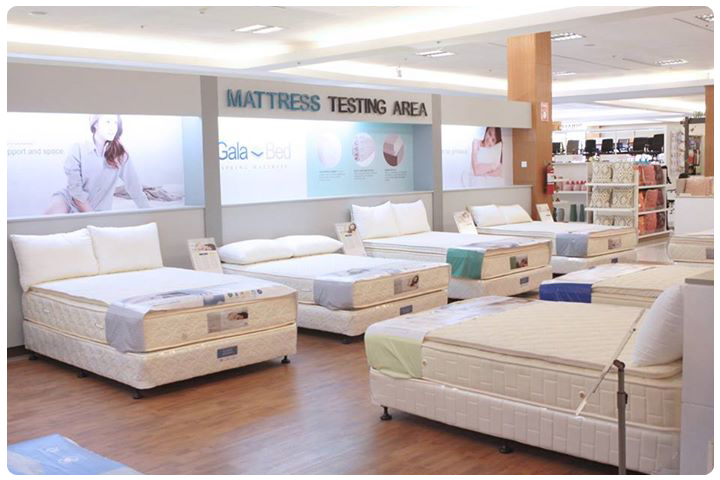 (I have a mild case of dextroscoliosis) Then, we scurried upstairs their showroom to look at bed frames. Most of their furniture are solid wood. That explains the price but I must say all of them are of quality. They have a lot to choose from! And they all picked what they liked best. While we like what Kei’s mom picked out, the padded headboard might be a potential asthma attack for me. The one Kei’s sister picked was also nice but only comes in double size. So again it is a no. The one with the curved headboard is too “classic” for Kei’s taste. –according to Kei he wanted something modern. -And I found out that the side table I liked was named: KAILEY-it goes for 4,800.00php. *if you ask me it sounds like my best friend’s nickname. And after a bit of looking around. 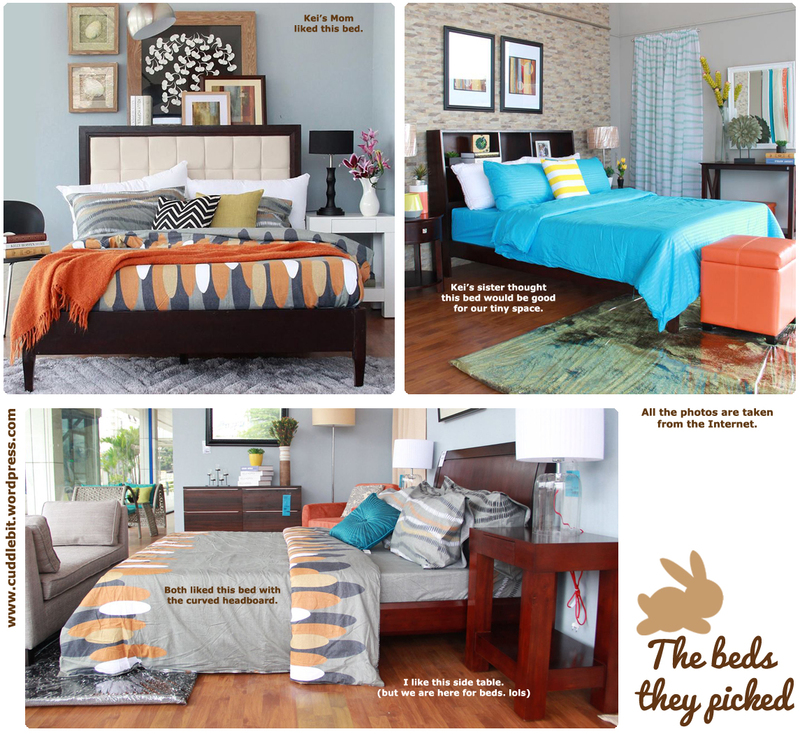 We found ourselves looking at the same bed. I managed to urge my phone to capture one photo, before the phone shuts down. Its name is CRAZY. Nope, we kid you not. I find it pretty. Cut textured, solid wood headboard, in a warm shade of maple. Kind of balanced out the edgy design. It also looked cozy. We all liked it. -Its only flaw, It doesn’t have the storage underneath. But It really is pretty. We were sold. *After all we could just get plastic storage bins to hide under the bed. To give a better look of it I searched for it on the internet and found it only in a different color. Just showing you a better picture of the bed frame. 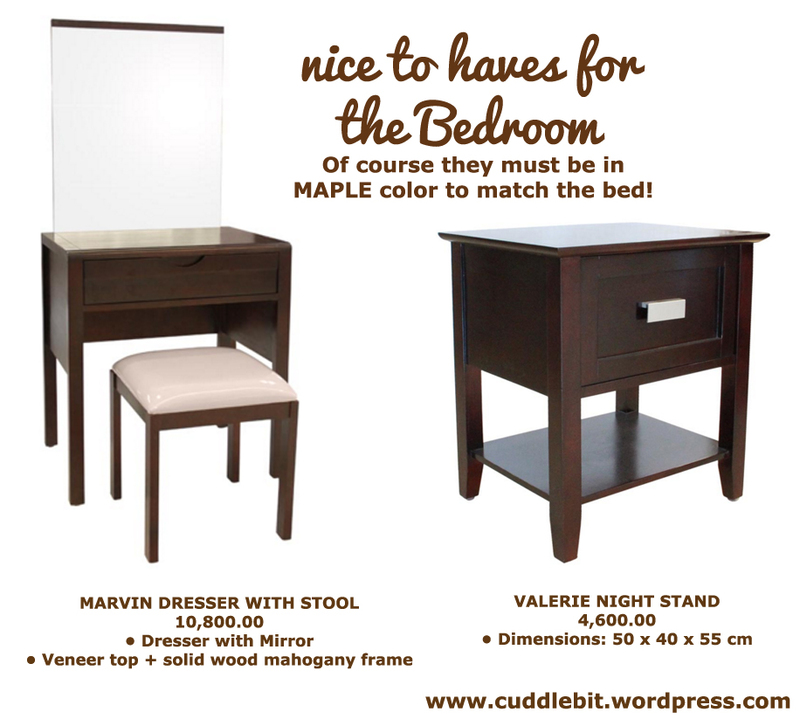 While it is the same bed frame, I liked the maple colored one better. 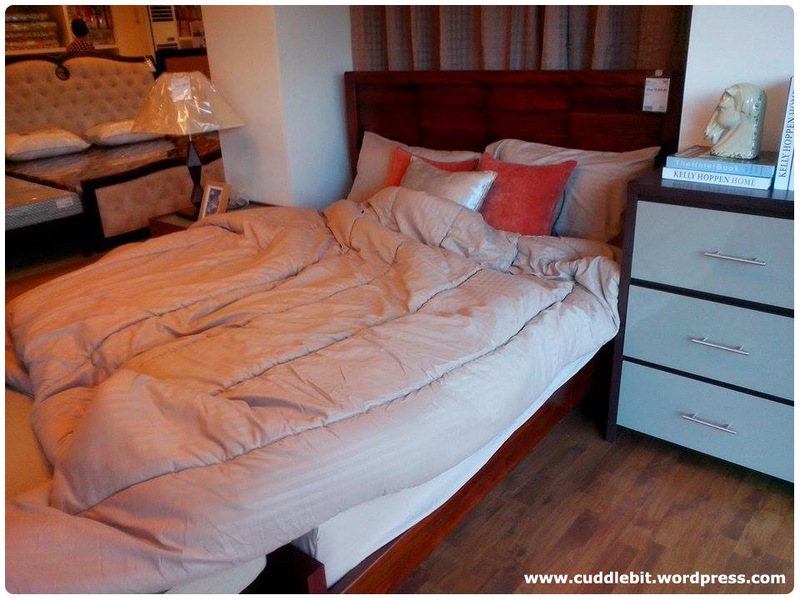 It shows the wood grain better and adds a cozy feel to the bed. See, told you it is CRAZY, just look at the crazy color options. lol. So, we finally got a bed! Woot! All thanks to Kei’s sister.-NOT REALLY. WE just lost the freaking bed (frame). So much for getting our hopes up. the UPDATE: Apparently MANDAUE FOAM sold the said bed frame we got on reserve to another customer. They have our mattress correct, but the bed frame is lost. The stocks are all sold out. Even the dark version. It would take long before they will get it back again. By that they broke our hearts. =( so heartbreak number two.-why is this so frustrating?! We went on looking at some of their other pieces that we thought would look good in our place. So here is what we (Kei and I) like for the bedroom. these two are in coffee, I want mine in maple. For the dining it would be this cute dining set! a place for all the nom-nom action. The sofas here in Mandaue Foam failed to capture my attention. But the extras for their living room really do! Here are my picks. a couple of ottomans, one side table and one center table to go. All in maple please. Sigh. We need more money, or more sponsors! Hahaha! 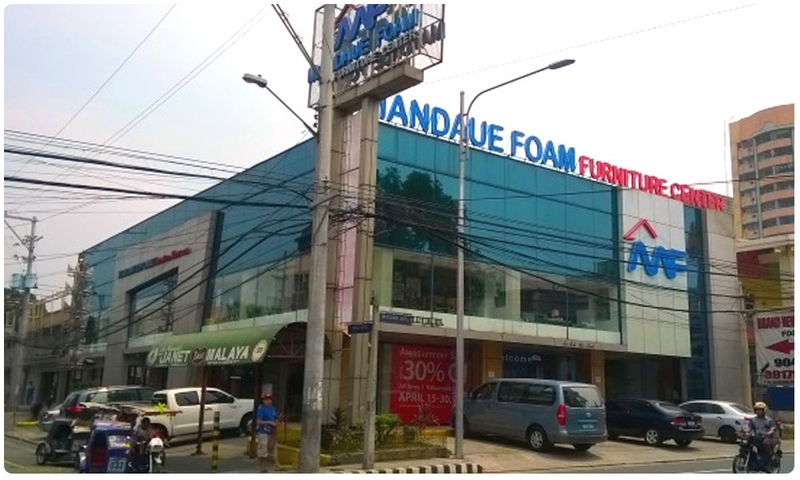 MANDAUE FOAM -I hope you did not promise what you cannot deliver. But whats done is done. We like your products, yes. But you failed us with your careless service. *All my reviews, opinions, and other stuff expressed here are our own and based on our own experience. This is not a sponsored post, Kei’s sister paid for the matress (from) her own pocket. Much Thanks! **I may have written before that we wanted a king sized bed, but due to the tight space we got a queen size. Our king sized beddings will be altered. -WE ARE NOW OFF TO LOOK FOR A BED FRAME FROM A DIFFERENT SUPPLIER. 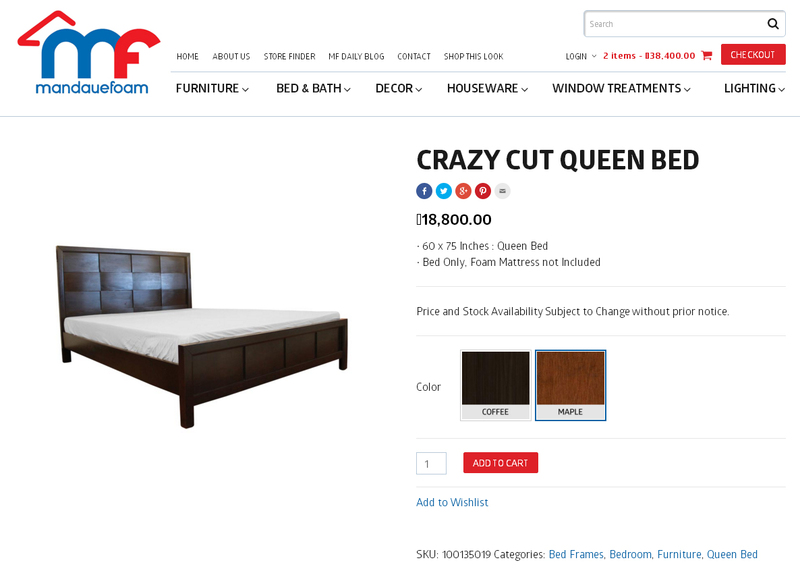 Categories: family, home, life, reviews | Tags: bed, bed frame, bedframe, center table, chairs, dining room, dresser, furniture, home, kei's sister, living room, mahogany, mandaue foam, maple, mattress, orthopedic, ottoman, Philippines, shopping, side table, solid wood, tables, wood | Permalink. So, I thought our invites are all sorted out. A sudden call revealed otherwise. The culprit: binding. Grommets look really rough against the dainty invite. 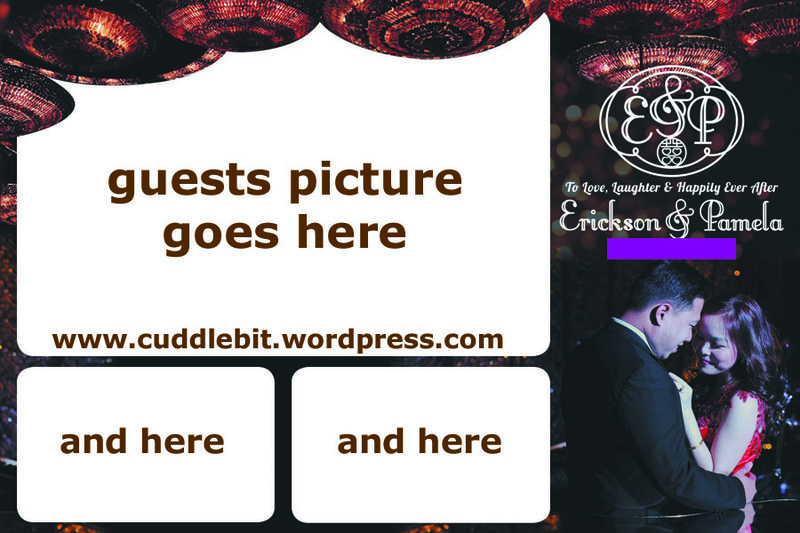 So, I am back to fixing the layout for our invites. Sometimes resources makes it hard for creatives to be creative. sigh. But I am on it. I can manage. I am also having a lot of issues with my dress and the dresses of my entourage. While I love love love my own wedding dress, it forces me to be poised. Too poised that it is a bit constricting on my movements. Dancing on it would be out of the question. I need another dress or no more dancing. Getting another dress made will be more of a mission impossible right now that it is only a few days till Christmas. *My dad does not want to do the father daughter dance (too shy and says he will be sure to cry and he doesn’t want that to happen). So the only dance we are doing is the couple’s first dance. Seems like even that would be in peril. Can I cry now? 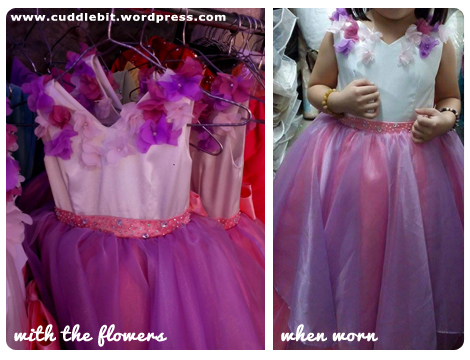 On the entourage dresses, only the flower girls’ dresses are the ones already available for second fitting, the bridesmaids dresses are still not ready and out time is running out! Oh, what to do?! what to do?!! *Maybe this “never-ending-stress” is why most brides snap and go on “bridezilla” mode, they now have my sympathy. 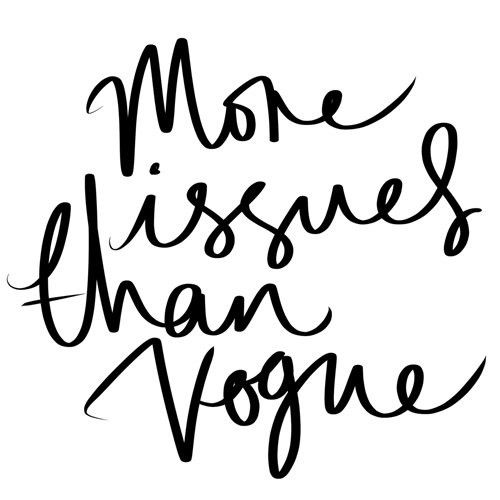 Categories: dresses, life, wedding | Tags: 2015, bride, bridezilla, issues, panic, planning, slump, stress, wedding | Permalink. I have been buried under a pile of things to do. Advance planning not really helping. Sigh. Newspaper style wedding (liturgy) programs are half done – I wanted to be unique and I wouldn’t mind doing the layout for my own program-will show them here once I am done. Our invites are sent to the printers- in the process of printing, photo booth frames and backdrop also done… and a big fat YES. I might be a bit crazy but, I D.I.Y.-ed. I created all of those projects on my own. 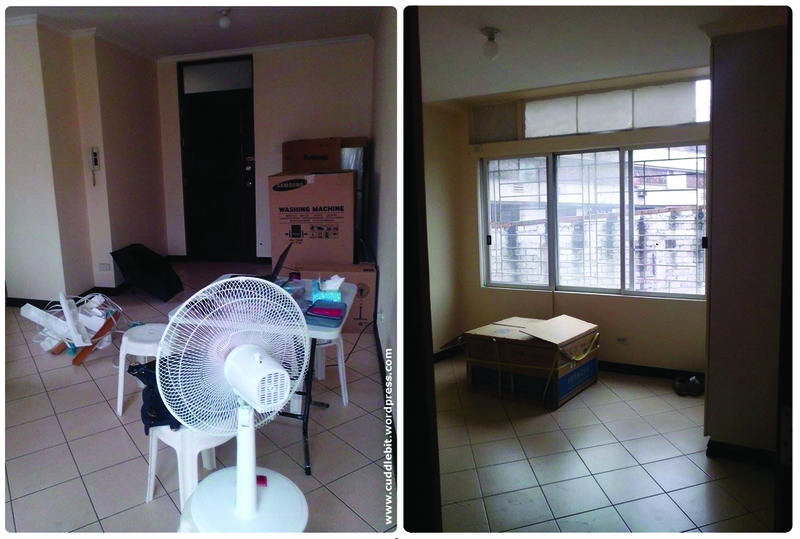 Is also busy with our soon to be home. Currently it looks like this. Still no furniture. But we have temporary tables and chairs as of the moment. They serve their purpose. 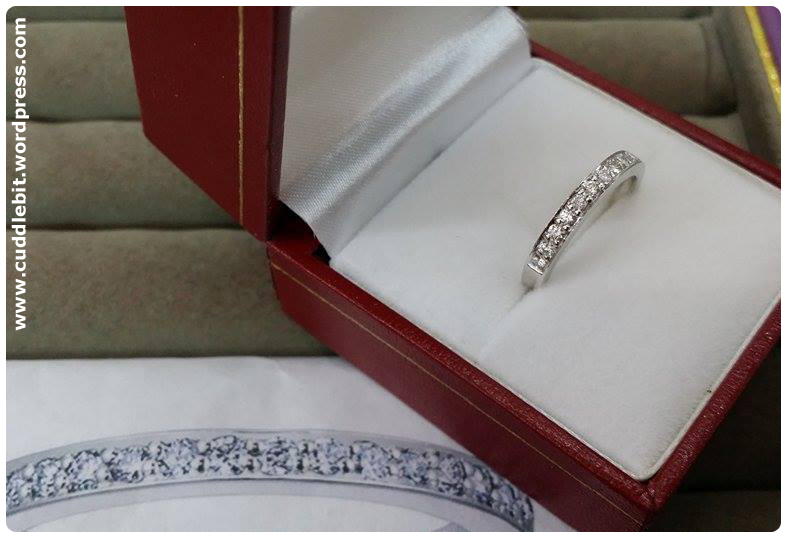 So far, the only thing that is near completion is our or should I say my wedding band/s! That was surprising because it was the one of the last things we crossed of the list…the cramming paid off?! lols. love the bling! See my printed peg with the ring-translated to the real thing! I have Atchie Helen of Helen Jewelry Store to thank for creating this sparkly bling! I really, really love it! **mention that you are a reader of Pam & Kei’s blog and you would be sure to get a good price. Next, I am up to hunt for an alternative to wearing a bathrobe (on the day of the wedding/preparation pictures). *All my reviews, opinions, and other stuff expressed here are our own and based on my own experience. This is not a sponsored post, we paid for this (from) our own pocket. 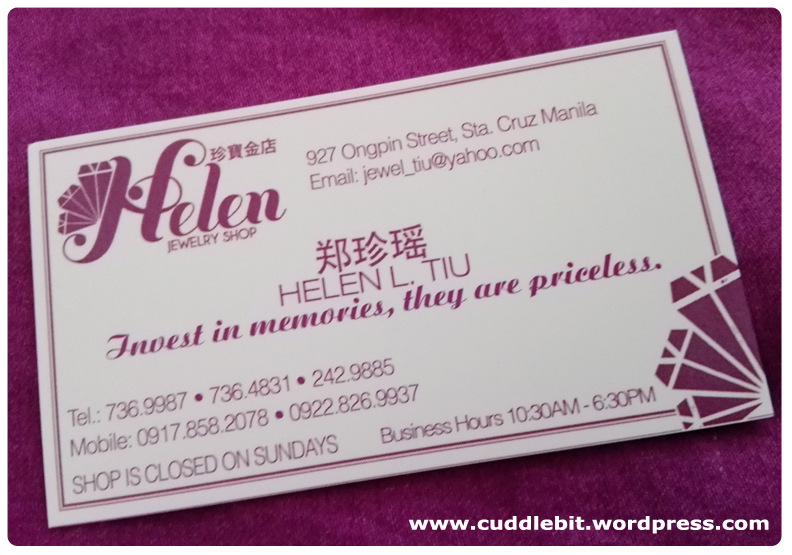 Categories: home, life, wedding | Tags: 2015, 2015 wedding, affordable, binondo, booth, bride, frame, jewelry, layout, ongpin, photo, reputable, review, ty po huat, wedding, wedding band, wedding bands | Permalink.